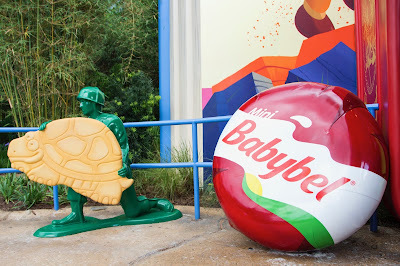 Mini Babybel® snack cheese plays a starring role in the all-new Toy Story Land, an 11-acre land at Disney's Hollywood Studios® located at the Walt Disney World®Resort in Lake Buena Vista, Fla. Guests in Toy Story Land will feel like they have shrunk to the size of a toy as Woody, Jessie, Buzz, Slinky Dog, the Aliens, Green Army Men and other Toy Story characters interact in the larger-than-life outdoor setting of Andy's backyard. The space incorporates both the fun of Mini Babybel and the magic of the hit Disney•Pixar Toy Story films. Woody's Lunch Box puts a modern spin on timeless menu favorites for all the members of the family to enjoy in an exciting themed dining experience, including tables with seats that resemble jumbo replicas of the Mini Babybel snack cheese and umbrellas that are modeled after the cheese's wrappers. Guests might even see one of the Green Army Men carrying a four-foot, jumbo cheese wrapped in its famous red wax. "In addition to offering a fun and delicious snack option that every member of the family can enjoy at Toy Story Land, we're excited to see the playful elements of Mini Babybel that fans know and love come to life in a way only Disney could imagine," Shannon Maher, brand director for Babybel, said. The adventure continues for fans outside the park in an exciting consumer promotion, One Magical Mission. Now consumers can use their Mini Babybel Original wrapper as a secret decoder at the official sweepstakes website, BabybelMagicalMission.com, for a chance to win one of thousands of prizes including a chance to win a vacation to see the new Toy Story Land area. Program ends Sept. 30 and purchase is not required. Walt Disney World Resort is a world-class entertainment and recreation center featuring four theme parks (Magic Kingdom Park, Epcot, Disney's Hollywood Studios and Disney's Animal Kingdom; two water adventure parks (Blizzard Beach and Typhoon Lagoon); 35 resort hotels (28 owned and operated by Walt Disney Parks & Resorts, including seven Disney Vacation Club resort properties); 63 holes of golf on four courses; two full-service spas; Disney's Wedding Pavilion; ESPN Wide World of Sports Complex; and Disney Springs. Walt Disney World Resort is committed to building better futures for children; last year, the company donated more than $44 million in cash and in-kind support to non-profit organizations in Central Florida and Disney VoluntEARS contributed 200,000 hours to community service. Located at Lake Buena Vista, Fla., 20 miles southwest of Orlando, Walt Disney World Resort opened Oct. 1, 1971, and is open daily, year-round. For more information, please visit aboutWaltDisneyWorldResort.com/.